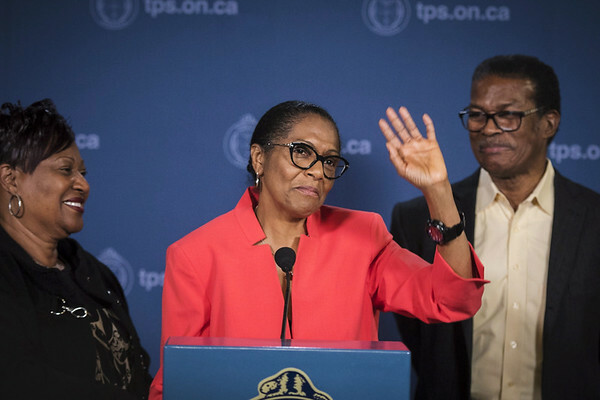 TORONTO - The mother of a toddler abducted in 1987 said Monday she was stunned when she learned he had been found and overcome with emotion at finally being reunited with him 31 years later. She urged others to never give up hope of finding their missing loved ones. She said she had endured many hard days over the 31 years and boarded a flight to reunite with her son shortly after hearing Thursday that he'd been found. Mann-Lewis said she cooked for her son and recounted the details of her life during hours-long conversations at her hotel. Allan Mann Jr. was arrested in Vernon, Connecticut, on Friday and accused of abducting his then-21-month-old son during a court-ordered visitation in Toronto on June 24, 1987. Authorities say he then entered the U.S. - where he had relatives - and obtained fake identification for himself and his son, including bogus Texas birth certificates. Authorities received a tip from a relative that he might be living in Connecticut under another name. The 66-year-old Mann appeared briefly Friday in federal court in Hartford, facing charges of making false statements in transactions with the U.S. Department of Housing and Urban Development. The Hartford Courant reported that the son sobbed quietly in the front row with his head in his hands and left the courthouse without commenting. Jermaine Mann had been told his mother died shortly after his birth, Toronto police said. “They lived, basically, a life of lies as to who they were and what they did, unbeknownst to Jermaine,” Toronto Police Det. Wayne Banks said. Allan Mann, who has dual Canadian and Ghanaian citizenship, was found living under the name Hailee DeSouza in HUD-subsidized housing in Vernon, about 12 miles east of Hartford, federal officials said. After facing his charges in the U.S. Allan Mann is expected to be extradited to face an abduction charge in Canada. In August, U.S. marshals interviewed several of Allan Mann's relatives and friends, including a family member who led authorities to Connecticut and his alleged alias, according to an arrest warrant affidavit prepared by a HUD special agent. Later that month, a forensic specialist from the National Center for Missing and Exploited Children analyzed an old photo of Allan Mann and the 2015 photo on DeSouza's Connecticut driver's license and determined they were likely the same person, the warrant said. The investigation has involved multiple U.S. agencies including HUD, the U.S. Marshals Service, Department of Homeland Security and the Social Security Administration, as well as Toronto police and Royal Canadian Mounted Police. Toronto Police Chief Mark Saunders said that his agency had held a conference on fugitive training in 2016 and said this very case was discussed with U.S. law enforcement officials. Posted in New Britain Herald, General News, State on Monday, 29 October 2018 16:57. Updated: Monday, 29 October 2018 17:00.